Details On Upcoming Documentary MEMORY: THE ORIGINS OF ALIEN Are Within! Filmmaker Alexandre O. Philippe previously explored the backstory behind the iconic shower scene in PSYCHO, now he looks to delve into a Horror/sci-fi classic in his new documentary, MEMORY: THE ORIGINS OF ALIEN. Memory was a script that Dan O’Bannon started in 1971, abruptly hitting a wall at page 29. 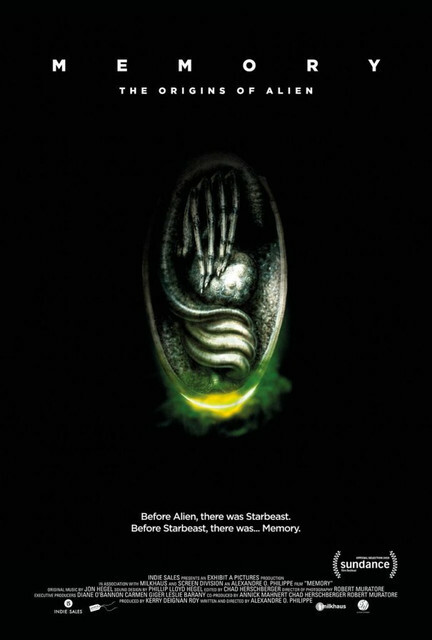 But after the idea gestated for several years, it ultimately took the form of Ridley Scott’s masterpiece Alien. Alexandre O. Philippe’s documentaries most recently 78/52, about Hitchcock’s Psycho shower scene have interrogated cinema’s cultural ripples. If MEMORY - THE ORIGINS OF ALIEN were only a comprehensive account of Alien’s origins ancient myths, comic books, H.P. Lovecraft, sci-fi movies, and parasitic wasps it would still be fascinating. But how did Alien lodge itself so indelibly into our cultural imagination? Philippe’s real interest lies in the deep resonance of myths and our collective unconscious. The strange symbiotic collaboration between Alien creators O’Bannon, Scott, and H.R. Giger suggests a greater synchronicity across history, art, and storytelling, a synchronicity that gives us the Furies, creatures of Renaissance painting, and even chest-bursting aliens. Propelled by a pure joy of cinema (and sociology), the film is strewn with unearthed archival material, designs, and story notes. It’s safe to say you’ll never think of Alien the same way again. MEMORY: THE ORIGINS OF ALIEN will make it's world premiere at the Sundance Film Festival as the Opening Night Midnight film on Thursday, January 24th.